NOTE: American Express is running an advertising campaign for its Business cards at the moment and asked us to write something about it as part of that. This technically makes this article an ad, although regular readers will recognise that the article has the same sentiments as other Platinum Business articles we’ve published in the last six years. If you are looking for an American Express Card for your small business, American Express offers two products in the UK – Gold Business and Platinum Business. My recent article on American Express Gold Business Card is here. Today I am looking at the American Express Platinum Business Charge Card®. 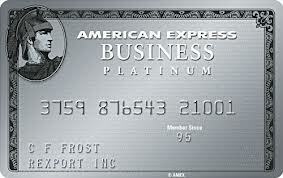 The official application website for the American Express Platinum Business Charge Card is here. With Gold, the key difference is that the Card remains a Charge Card whilst the personal version is now a Credit Card. The annual fee is lower but you do not receive the Lounge Club passes. With Platinum, there are some key tweaks to the benefits package, including better travel insurance benefits. You also receive a far bigger sign-up bonus. We will cover these as we go. Note that the American Express Platinum Business Card is a Charge Card, not a Credit Card. You MUST clear your balance in full at the end of each month. The upside is that there is no pre-set spending limit. What is the sign-up bonus and points earning rate? You will receive 40,000 American Express Membership Rewards® points when you spend £6,000 within 3 months. This is a very generous incentive as long as you are confident of meeting the spending target. It offsets the majority of the £450 annual fee for the first year. It is worth noting that the sign-up bonus on Platinum Business (40,000 points) is bigger than the bonus on the personal Platinum Card (30,000 points). There is one thing which is important to clarify as many HFP readers will already hold the personal Gold or Platinum Cards. You CANNOT get the sign-up bonus on Gold Business if you already have, or have had in the previous six months, a personal Gold or Platinum Card or any other card which earns Membership Rewards points. For clarity, you will definitely receive the sign-up bonus if you already have a British Airways Amex, SPG Amex, Platinum Cashback Amex or any Amex issued by Lloyds Bank. For your on-going spending, you receive 1 Membership Rewards point per £1 spent on the Card with a few minor exceptions. What is the best way to use your points? Membership Rewards points can be converted into a range of benefits. In our opinion the most valuable options are converting into frequent flyer programmes (including Avios points and Virgin Flying Club) at a ratio of 1:1. This means that the sign-up bonus is worth 40,000 Avios points or 40,000 Virgin miles. American Express Membership Rewards points also convert into Hilton Honors (at 1:2), Marriott Bonvoy (at 2:3) and Radisson Rewards at a generous 1:3. There are also a lot of non-travel redemptions including retailer gift cards – American Express is a partner with M&S, House of Fraser, Amazon etc. Any other Platinum Business benefits? Yes. Whilst the annual fee for the Platinum Business Card may initially seem steep, there is a lot of value to be had from the benefits package. I have had a personal American Express Platinum Card for almost 20 years and so clearly see value in what I get back. You will receive airport lounge access via a complimentary Priority Pass Card. Priority Pass is a network of 1,200 airport lounges across the world, including eight in London Heathrow and five in London Gatwick. This includes the Aspire lounge in Heathrow Terminal 5. Your Priority Pass allows an unlimited number of free visits to their lounges over the year together with a guest. Additional guest are charged at £20 although some lounges admit children for free. You can give a Priority Pass Card to a second person by issuing a free supplementary Platinum Business Card to them. This person can also bring a guest. If this is your partner or spouse, you would both be able to get into the lounge for free, with two children, when travelling for leisure. You will receive access to the new Plaza Premium Lounge in Heathrow Terminal 5, reviewed here. This is not a Priority Pass lounge but American Express Platinum Business cardholders can get access, with a guest, by showing their Platinum Business card at the front desk. You will receive comprehensive travel insurance for both business and leisure travel. This is a very valuable benefit because of the high level of coverage available – you can take a look at the policy document here (PDF). Unlike the personal Platinum American Express Card, which was weaker coverage, the insurance available on the Business product remains gold plated, in my opinion. There is no excess to pay at any time and you are covered up to the age of 80. There is also no requirement to pay for any part of your trip on the card in order to be covered. You can also cover family or work colleagues by issuing them with a free supplementary card on your account. You will receive Gold status in the Marriott Bonvoy hotel loyalty scheme. This will give added benefits at Marriott, Renaissance, The Ritz-Carlton, Moxy, Aloft, Sheraton, Westin, W, Aloft, St Regis and The Luxury Collection properties amongst others. You will receive Gold status in the Radisson Rewards hotel loyalty scheme. This will give added benefits at Radisson, Park Plaza and Park Inn hotels. You can access the Amex Fine Hotels & Resorts Programme. This offers genuine added value benefits at a large number of luxury hotels across the world. These include a GUARANTEED 4pm check-out, free breakfast, an upgrade if available at check-in and typically a $100 credit towards on-property spending. We have written extensively about Fine Hotels & Resorts in the past and rate it highly. Note that you do not receive the Hilton Honors Gold, Melia Rewards Gold or Shangri-La Golden Circle Jade hotel status Cards that would come with a personal American Express Platinum Charge Card. You will also receive access to the Platinum Business concierge service as well as other standard Amex benefits such as Global Assist, emergency card replacement, refund protection and purchase protection. What is the annual fee for Platinum Business? The annual fee is £450, billed with your first statement and then annually thereafter. As long as you use the Card exclusively for business expenses, the annual fee is a tax deductible expense. Depending on when in your monthly cycle you make a payment, you will effectively receive up to 54 days free credit on your spending. American Express statements generally provide more underlying transaction detail for flights and certain other transactions than Visa or Mastercard statements, making it easier to reconcile transactions. The only major issue with Amex Platinum Business Card is the lack of Amex acceptance by some suppliers but Amex is working on increasing their coverage. If you are a sole trader or own a small business (even a service company) then the American Express Platinum Business Card is worth a look. If you use the Card exclusively for business purchases, and therefore can deduct the annual fee as a business expense, the net cost – especially for higher rate taxpayers – is reduced. The 40,000 Membership Rewards points for signing up are an excellent incentive and the comprehensive travel insurance, Priority Pass and hotel status Cards add a lot of value. The official American Express website, which contains full details and the application form, is here. Hi, just wondering whether being a business card does the travel insurance cover just the cardholder or spouse and children too? And/or the family of additional cardholders too? The document is on the Amex website for the card, best if you study it yourself due to the risk of incorrect advice. The personal card is 30,000 points for £2k spend vs 40,000 for £6k. You are getting a third more points for three tines the spend. It also comes with a greater benefit package. I guess this is why some use the personal card as a business card and charge the fee as a business expense. Although if you want to look at it another way and compare, that 4K of extra spend earns 14000 extra points which is a pretty amazing rate of 3.5MR/£. Why 14,000 – Is the earning rate not the same on the two cards? The true cost is what else you could have done with the £4k spend that could potentially have generated a return greater than 10,000MR. Or, if you spend the £6k anyway, you will get 10k extra points. So depends of you need the £4k extra to earn points on some other card. 1) No eurostar lounge access. 2) Priority pass does not include guests. 3) Still charging me £300. The last one is keeping me in it. Despite no hilton benefits and the rest. The Primary Platinum Business Cardmember and the first Supplementary Platinum Cardmember are elegible for part of the American Express Global Lounge Collection and will be enrolled automatically. In order to access over 500+ lounges in the Priority Pass programme, the Cardmember must present a valid Priority Pass membership card in their name, along with a boarding pass for same day travel. The Primary Platinum Business and supplementary Platinum Business Cardmembers who are enrolled to the programme can each bring 1 additional guest free of charge. Any additional guests will be charged a fee at the prevailing rate – currently £15 per person, per visit, to his or her American Express Platinum Card. Subsequent years’ renewal terms and conditions are at the discretion of Priority Pass. For Priority Pass Conditions of Use visit prioritypass.com. The Cardmember agrees to abide by the Conditions of Use, as detailed at prioritypass.com. Talking from having been charged, queried and confirmed it was different from personal one. If they changed it they don’t tend to tell you. Or did not, and cut and paste the agreement. It’s a version of the PP card which is different. But frankly if the content is no less relevant than our usual content I will run as many as are offered. What you don’t realise is that some sites charge for ALL articles. When we discuss Heathrow Rewards today, we have not asked for money for doing that. Most other sites do. A blogger survey released by Vuelio this week showed that 75% of articles on sites with 10,000 users per month (we have 300,000) are paid for. We are, what, 5%? I don’t see anything wrong with this if i’m honest – I don’t think it’s being overdone. We read HFP for free and he’s got wages to pay plus himself. +1 (not to mention the fact that they are all clearly flagged as paid-for posts, which most sites don’t bother to do). No it doesn’t, it shows 75% of articles on 9% of those blogs are monetised. It’s also very different comparing yourself to fashion blogs etc that do charge for exposure – Heathrow Rewards are never going to do that, fashion sellers will. Not that I disagree with your sentiment – you don’t have that many, they’re generally relevant and are clearly marked. Heathrow Rewards WOULD pay if we pushed them. Where else can they reach the sort of numbers we have for a few hundred quid? I’m not saying they have a better alternative, I’m saying they probably don’t care about blog PR as much as a fashion house does. Though I don’t quite understand the logic here. You take money for adverts that you wouldn’t have run otherwise, but companies are willing to pay you for an article you wanted to write anyway but you don’t take the money? I could go to HR and threaten not to cover them any longer unless they pay. I’m not going to but that is how much of the industry works, yes. And arguably why not? We can sell £100k of flights off an article if it is a really hot deal. Shouldn’t we be sharing that value created? All I said was that you drastically misstated the results of that blogger survey and that Heathrow Rewards are less interested in paying for blog posts than fashion houses/retailers are. If you think those airlines have no other way to generate those sales then feel free to demand money from them! Aren’t additional guests now charged £20 with Priority Pass? The Primary Platinum Business Cardmember and the first Supplementary Platinum Cardmember are elegible for part of the American Express Global Lounge Collection and will be enrolled automatically. In order to access over 500+ lounges in the Priority Pass programme, the Cardmember must present a valid Priority Pass membership card in their name, along with a boarding pass for same day travel. The Primary Platinum Business and supplementary Platinum Business Cardmembers who are enrolled to the programme can each bring 1 additional guest free of charge.Any additional guests will be charged a fee at the prevailing rate – currently £15 per person, per visit, to his or her American Express Platinum Card. Subsequent years’ renewal terms and conditions are at the discretion of Priority Pass. For Priority Pass Conditions of Use visit prioritypass.com. The Cardmember agrees to abide by the Conditions of Use, as detailed at prioritypass.com. What value do we out on the travel insurance? Depends how many kids you’ve got, extended family etc. Until she hit 70 – the personal Plat limit – my Mum had a supp on my personal Plat for example purely to get her the travel insurance. From memory, the criteria are pretty generous, and stable conditions without recent intervention are covered. Is this card tied to the business or the person. My wife and I are both directors (and we actually have two ltd cos) – can I sign up for one,then six months later can she, while I cancel. Rinse and repeat. And are there referral bonuses available as with personal plat? I’m interested in the referrals? Colin did you find the answer? I currently have a personal Gold card. I’m a director of a small Ltd company for contracting. Can I get this offer, and can I put my usual day to day personal transactions on the business Platinum? What would the downsides to this be?